Who doesn’t love a good milkshake? I only wish I could have one of these yummy, goodies everyday…..but I don’t think that would be setting a good example of “healthy, nutritious living.” We have to indulge every now and then; however! 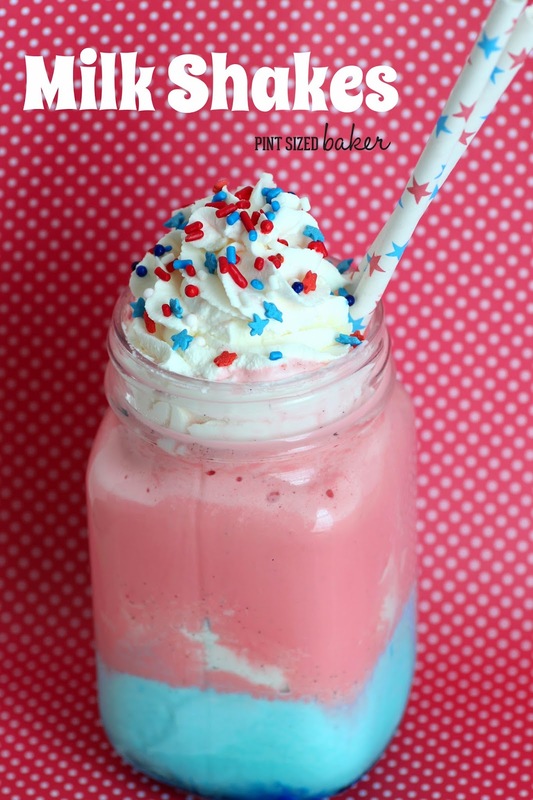 Although the Red, White, and Blue Patriotic Milkshake is a plain Jane Vanilla ice cream shake, is a MUST splurge for 4th of July. Add two to three BIG scoops pf ice cream, 1/2 cup of milk, and blue food coloring to a blender. Blend and pour into cold glasses. Place into freezer. Rinse and add ice cream, milk, and red food coloring to make the red layer. Top off the glass then add the whipped cream and sprinkles. Slim down your side dish! Love cheesy mashed potatoes? Look for low-fat cheese blends or part-skim ricotta to whip into your creation.